If you own a business, you probably have a website. You want to use that website to help you with online advertising, lead generation, branding, search engine optimization (SEO), and more. Before you can do all of that, you have to actually develop the site. Here are some of the basic elements of web development that you should understand as a business owner. One of the most basic elements of web development is HTML. HTML stands for Hyper Text Markup Language. It is the basic format used to construct websites. It’s basically the code you have to use in order to format text on a web page. HTML consists of a series of elements that you use to enclose different parts of your content to make it appear or act a certain way. For most functions, you have to have the opening tag, the closing tag, the content between the tags, and the element within the tags. CSS is another essential programming language; it stands for Cascading Style Sheets. It is a style sheet language used to define web design elements such as color, layout, font size, and more. This feature can allow multiple pages to share the same formatting to make the online experience faster and easier for the user. In relation to HTML, CSS tells the browser exactly how you want the HTML tags to function. The front end in web development refers to the things you can actually see on the website. Typically, the front end includes the code, design, and debugging applications, as well as ensuring a seamless user experience. The front end also involves HTML and CSS. A back-end web developer services the side that deals with how the site works. A back-end developer makes updates and changes to the site’s architecture, and they also monitor the functionality of the site. This type of web development consists of three parts: the server, applications, and a database. Nearly 61% of global internet users research products online. 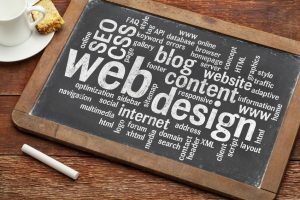 Because of this, you’re going to want a website that draws users in and engages them. Web development is a key element to get you there, so it’s essential that you at least understand the basics. For more information, give us a call today!